The sold-out Coachella already announced its lineup and sideshows, and now the Do LaB Stage lineup has been announced. As the press release notes, “The Do LaB stage, unlike the festival’s other five stages, will change its lineup each weekend. Musicians will come from afar – Berlin, France, Australia, England, and Spain – to play this memorable stage.” The one exception is Lucent Dossier Experience plays both weekends. 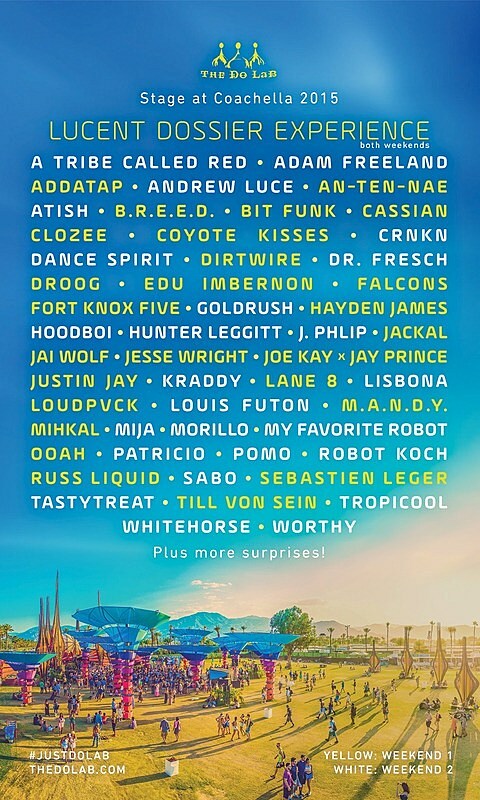 Weekend 2 has A Tribe Called Red, Adam Freeland, Andrew Luce, Atish, CRNKN, Dance Spirit, Dr. Fresh, GoldRush, Hoodboi, Hunter Leggitt, J. Philip, Lisbona, Kraddy, Louis Futon, Mija, Morillo, My Favorite Robot, Patricio, Pomo, Redux, Robot Koch, Sabo, TasyTreat, Tropicool, Whitehorse and Worthy.